Creamy Fairtrade Milk Chocolate 33% Cocoa with roasted peanuts. 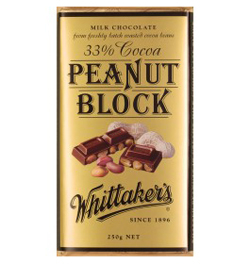 Milk Chocolate (Sugar, Cocoa Solids 33% (Pure Cocoa Butter, Cocoa Mass)NZ Milk Powder 17%, Emulsifier (Soy Lecithin), Vanilla Flavour), Roasted Peanuts 25%. Milk chocolate contains Cocoa Solids 33%, Milk Powder 17% minimum. The best. Not incredibly sweet like other chocolates out there, just enough to make everybody happy.